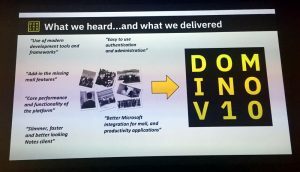 Further to my recent post, I was at CodeNode in London last Tuesday to check out this year’s Domino Jam v11. The event was again organised by IBM; however, HCL have committed to continuing the initiative following their acquisition of ICS, so this should be a regular event from now on. First impressions were good, with significantly more attendees than the previous year. 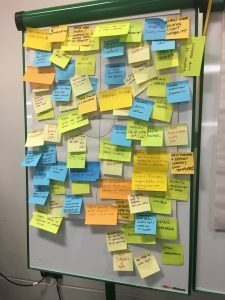 Format was similar to 2018, with a ‘state of the nation’ presentation and QA session, followed by working on some sticky-note-based ideas, which we then brought together on a whiteboard and organised in terms of area and priority. Andrew Manby was there from IBM, and HCL’s presence was headed by Richard Jefts – an ex-IBMer who is the main person leading future Domino development. Richard’s enthusiasm and vision for the product was infectious, and he has big plans for 11 and beyond. 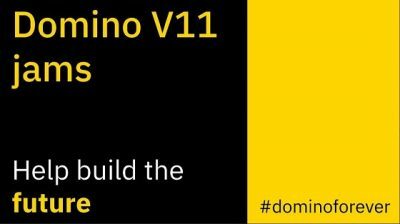 A large number of additional functionality in Domino 10 was implemented as a direct result of last years’ Jam. HCL are making substantial investment into Sametime 10, including simplifying installation, persistent chats across devices, and improved AV capabilities. It will also achieve release parity with Domino by the end of the year. A development of the ‘citizen coder’ concept, empowering users with little to no coding experience the ability to develop applications through drag and drop. Version 10 was concentrating on the back-end, version 11 will have its focus on the front-end. To this end, HCL had a number of their UX designers at the Jam asking questions. April 1st is the target date for completing their search/replace of the code and moving Domino from IBM to HCL Software branding. Licencing’s likely to change from PVU-based, however that’s the only likely immediate change – everything else will continue as normal in the short term following HCL’s acquisition. Last year’s Jam left me with cautious optimism… largely a case of ‘it sounds good, but I’ll believe it when I see it’ – especially with regards to marketing. However, during 2018, I was surprised at how many of the ideas and initiatives mentioned by them and suggested by us that were delivered. Based on this, and what they said at Tuesday’s Jam, 2019 should be a very interesting year.